When a movie premiers, promotion activities are carried out to support the movie. The company investors, the directing of the director, the actor’s acting, to receive recognition for each of their efforts and labor; they need an audience to watch and critique. Thus the people who appear in the movie need to go through a rough schedule. These people who meet various media, repeat the same talk, and even answer impish questions, they are actors. In the midst of a reporter asked if he was tired, actor Kang Haneul said no and waved. And the 3 characters of Kang Haneul’s name were engraved onto the reporter’s recorder. In his interview for ‘New Trial’ he also took care of the convenience of the other person in the case that they could me mixed up by his voice and another interviewee. His consideration melts wariness and softens the atmosphere. Kang Haneul, a.k.a. ‘moving story machine’, even in public work, he doesn’t hold back his moving stories and met us on the afternoon of July 26th at Seoul Jongro-gu Samcheong-ro 2gil at a café. Last time it was winter and now it is summer. Kang Haneul works no matter what season it is. His new movie is ‘Midnight Runners (Director Kim Joo Hwan). It is a work that tells the story of two police academy students who besides their biological age and good looks have nothing in common and end up seeing a crime and running around in the dead of night. The endless running in the middle of the night is because of the English title ‘Midnight Runners’ (Korean literal title is ‘Young Cops’). In order to solve the case the two men run and run. Perhaps running symbolizes the movement of youth. In a nutritious supplement drink ad, actor Gosoo ran and ran in order to express a youth that was protecting something. It was an ad of 1999 when a new millennium was about to come. It has been 18 years but youth is still in the middle of running. It’s not just running, ‘Midnight Runners’ is a movie full of youth and vigor. We have to mention ‘Twenty’ among Kang Haneul’s filmography. The two sides of ‘Midnight Runner’ are Kang Haneul and Park Seo Joon. Actors Sung Do Il and Park Ha Sun portray the roles of Professor Yang and Disciplinary Chief Joo Hee but 90% of the fil is created by the two ‘youth actors’. In ‘Midnight Runners’, Kang Haneul is theoretical police academy student Hee Yeol and Park Seo Joon is motivated police academy student Ki Joon. They both are passionate but Ki Joon is only action and Hee Yeol uses his learning. It’s a formal question to ask about Kang Haneul and Park Seo Joon’s chemistry but we had to ask about the strong points of his colleague actor in this movie. “When I first met Seo Joon hyeong my first impression was ‘This person is full of confidence.’ Something about him was dignified and confident. I wondered if he acted full of confidence too and as expected it was true. No matter what dialogue or situation, he acted full of confidence as if ‘I always do this well’. Kang Haneul was born in 1990, Park Seo Joon was born in 1988, and Director Kim Joo Hwan was born in 1981. As they are their 20s and 30s this is a key role in making this work in which we are interested in the differences that makes them apart from other filming sites. Artists who live youthfully are under the public’s eyes, but body and mind are a different aspect, the invisible glass wall is time’s layers that cover humanity. Is it because of the fact that the topic is youth? There is a lot of cursing in the film. It is constantly expressed. We understand Director Kim Joo Hwan’s intention. Generally it is taboo but cursing is usually used among people you are close with in daily life. Even so, we were curious. Were they worried about dislike of cursing just like they were worried about the non-universal dialogue of ‘Overwatch’? We asked about the keynotes of acting as Hee Yeol. Summarized as a ‘theoretical police academy student’, Hee Yeol is a gifted person from a science high school. While his friends chose the path of going to Korean Advanced Institute For Science and Technology (KAIST), he took an abnormal route by applying for a police academy. Is it because he’s smart? Is it because he has a lot of concerns? After entering school Hee Yeol says “If you don’t disinfect your hair clippers, you will get bacterial mold infection on your skin…” and shudders. In front of the provided meal sausage, he deliberately memorizes clearly all the components of the sausage, warning that it causes cancer. Hee Yeol is a light character. Although he’s more dimensional through the fact that he wanted to walk a different path as others through his background as a ‘science high school’ and now as a police academy student, the attributes of a youthful and entertainment movie do not weigh heavily upon him. This aspect makes you think of Kang Haneul’s work in ‘Dongju: The Portrait of a Poet’. Kang Haneul acted as poet Yun Dong Ju in the film directed by Director Lee Joon Ik. Hee Yeol is light while Yun Dong Ju is heavy. Because of questioning greed, he answered that he wasn’t greedy with physical things like work, money or fame. And so he fiddled with the Buddhist rosary beads on his wrist saying worringly “It seems like I am going to a (moving story) again like this”. At this the reporter carefully asked a question. How would he cope with his future greed after discharging from the army? Isn’t the one who acted as youth Hee Yeol in ‘Midnight Runners’, the youth Kang Haneul? We were curious as to how he would cope with the middle-age Kang Haneul who might have greed. This is human Kang Haneul’s affirmation. 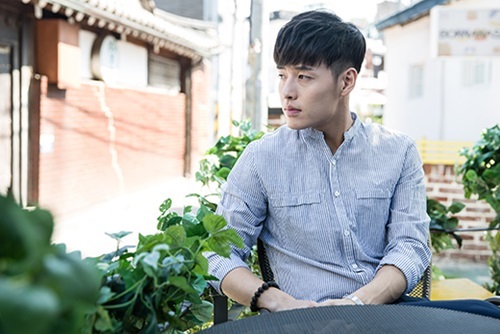 Kang Haneul is wary of competition with other works but audiences are paying attention to the competition of box-office sales between the four actors. In addition, when putting the standard of importance of characters, just like how police academy student Hee Yeol is light and real-life character Yoon Dong Ju is heavy, ‘Midnight Runners’ is a light movie focused on Hee Yeol’s squabbles and realization of justice instead of trying to portray a message. It has the power of being contrary to the other two movies. Can Kang Haneul surround his last work before enlistment with gold? The movie will be shown from August 9th, is 109 minutes long, is PG-13, the break-even point is 2,000,000 people, and the production cost is 7 billion won. Next articleJi Changwook reveals his shaved head.